This large assortment of hand-selected seasonal flowers will brighten any room! With small plots of progressively taller flowers, this artistic arrangement has the feel of a small garden. 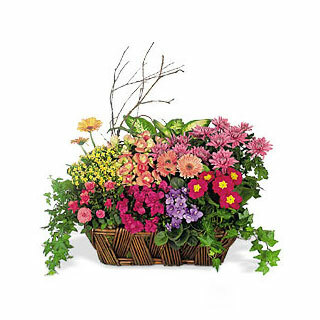 When you want to send a flower basket that is sure to turn her day around, the Chorus of Flowers gift basket is the perfect selection! PLEASE NOTE: The colors and flower selection may vary depending on availability. "This was the first time we worked with the company and the experience was great. We are in South America and we sent gifts to several countries. We were afraid that we would not be able to control the delivery and/or the situation, so we repeatedly sent inquiries. We received immediate response to all our questions and doubts, we were informed of every package delivered or processed, and the corporate specialist that we worked with was very accurate, kind, helpful and professional, I highly recommend them. It is a serious and responsible company."